UNL studies illustrate that adequate nutrition during late gestation has postnatal impacts on progeny. Photo courtesy of Troy Walz. Recent research has shown maternal nutrition during late gestation can have lasting impacts on calf health, growth, and performance postnatally. These impacts can include improved weaning weights, yearling weights, and marbling scores of progeny. For an excellent in-depth review on the implications of fetal programming, visit https://digitalcommons.unl.edu/rangebeefcowsymp/319/. The following is a discussion of different strategies for late gestation nutrition to improve subsequent calf performance. During the last trimester of pregnancy, the NRC recommends multiparous cows receive a diet with 7.9% crude protein (CP) and 54% total digestible nutrients (TDN). During the winter months, range forage CP and TDN values fall below this requirement, therefore, supplementation may be beneficial. Crude protein is made up of two fractions, rumen degradable protein (RDP) and rumen undegradable protein (RUP). RDP is used for ruminal bacteria growth and efficiency, and will contribute to the total amount of protein available to the cow. Previous research has determined 0.31 lb supplemental RDP/d per cow is adequate to meet cow maintenance requirements overwinter for a March-calving herd (1996 Nebraska Beef Cattle Report, pp. 14-16). Although crude protein is often the limiting nutrient in extensive grazing systems, greater TDN values improve efficiency of ruminal bacteria. Increased bacterial efficiency translates to increased protein and energy availability for the cow and developing fetus. Dams grazing winter range during the last two months of gestation had 18% fewer calves born during the first 21 d of the calving season, which resulted in lighter calves at weaning (-22 lb. ; 2009 Nebraska Beef Cattle Report, pp. 5-8). Moderate levels (1 lb/d per cow) of a supplement (42% CP, 73% TDN) provided to dams grazing winter range in late gestation increased percent of calves weaned (+7%; 2006 Nebraska Beef Report, pp. 7-9). It is possible additional nutrient availability to the cow and her fetus resulted in improved postnatal calf health (Larson et al., 2009). In a separate study, progeny born to supplemented dams (1 lb/d per cow; 28% CP, 89% TDN) had increased hot carcass weights (+19 lb.) and an increased percentage of steers grading USDA choice or better (+13.6%; 2009 Nebraska Beef Report, pp. 5-8). Dams offered meadow hay and supplemented during late gestation at a rate of 1.8 lb/d per cow (32% CP, 88% TDN) gave birth to steer and heifer progeny who exhibited improved feed efficiency in the feedlot (Summers et al., 2015). A cost analysis was performed on these calves and showed increased weaned calf and carcass values compared to controls. Interestingly, late gestation maternal nutrition has been shown to have impacts on the immune system of calves postnatally. Calves born to dams who were energy restricted during the last 40 d of gestation, showed reduced serum antibody titers to bovine viral diarrhea virus (BVDV) type 1a following vaccination (Moriel et al., 2016). A serum antibody titer is an indicator of immune protection and vaccine efficacy in cattle. 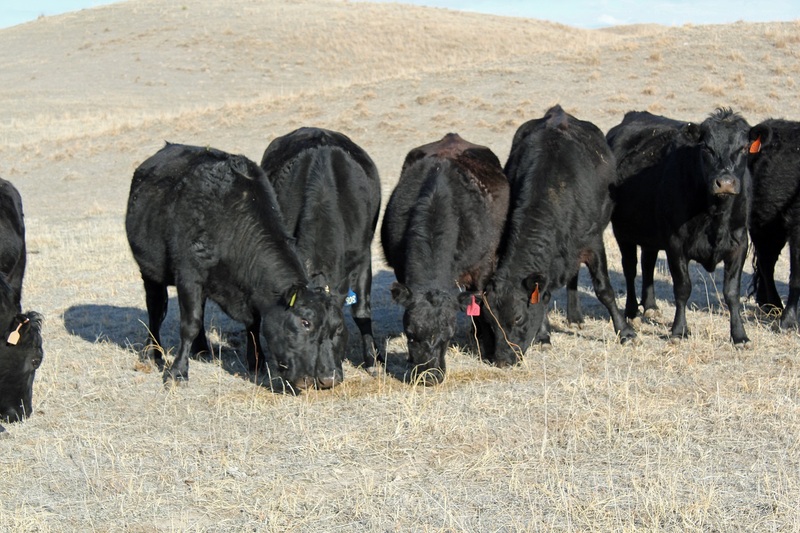 It is possible a short period of energy restriction in late gestation, similar to that experienced by dams grazing winter range in the Nebraska Sandhills, may lead to immunosuppression in calves. These studies illustrate adequate nutrition during late gestation has postnatal impacts on progeny. Protein supplementation (0.28 to 0.58 lb/d of protein) during late gestation may improve progeny weaning weight, efficiency in the feedlot, and increase carcass performance. Dam rebreed pregnancy rate was not significantly impacted by late gestation nutrition. Larson, D. M., J. L. Martin, D. C. Adams, and R. N. Funston. 2009. Winter grazing system and supplementation during late gestation influence performance of beef cows and steer progeny. J. Anim. Sci. 85: 841-847. Moriel, P., M. B. Piccolo, L. F. A. Artioli, R. S. Marques, M. H. Poore, and R. F. Cooke. 2016. Short-term energy restriction during late gestation of beef cows decreases postweaning calf humoral immune response to vaccination. J. Anim. Sci. 94. doi:10.2527/jas2016-0426. Summers, A. F., A. D. Blair, and R. N. Funston. 2015. Impact of supplemental protein source offered to primiparous heifers during gestation on II. Progeny performance and carcass charecteristics. J. Anim. Sci. 93: 1871-1880. doi:10.2527/jas2014-8297.